You’re nailing your training- you’re increasing testosterone, adding muscle and getting stronger week after week. You’ve tuned in on you’re diet and are seeing some good results. 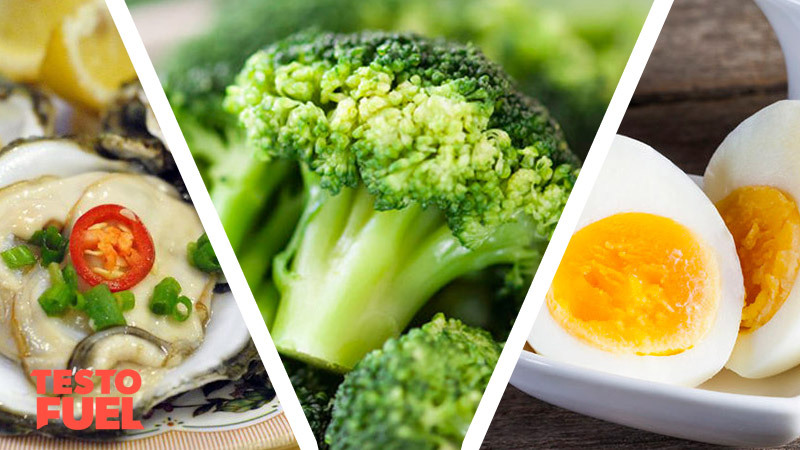 You’re food may be good for muscle building, but are you getting the best testosterone boosting foods? Having optimal testosterone levels makes all the difference to your athleticism, health and body composition. If you are finding that your progress is starting to slow down, or you need that little extra push to achieve your goals then read on to find out if you are getting the best from your current diet. Intense or chronic exercise as well as a zinc deficiency is associated with abnormally low testosterone concentrations. The essential mineral zinc is essential for producing and supporting optimal testosterone levels, as well as a host of regulatory processes including enzymes (metalloproteins) and growth factors (growth hormone). It also has anti-oxidant properties that can help to maintain overall health. This seafood is made up of 78% zinc making it the richest natural source available. One study  found that by taking 3mg/kg/day of zinc, male wrestlers increased their total and free testosterone levels as well as physical performance markers. Likewise, Jalali et al  found that supplementing 250mg zinc sulfate daily for six weeks was associated with an increase in the male hormone, as well as other important male hormone regulators including luteinizing hormone. 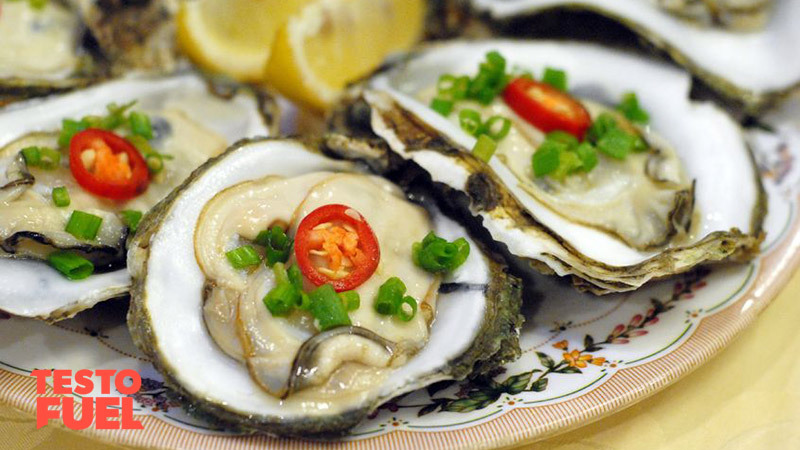 Additional benefits of oysters in the diet include improved liver function, mood state and immune system. They are also an important estrogen inhibitor. Unfortunately oysters can be quite expensive so your next best bet would be to look at extract-containing supplements. Learn more about oyster extract here. Top Tip: Other sources of zinc include beef, lamb, wheat germ and mushrooms. These little gems are a great source of vitamins B, C, D, E and K as well as also being another great source of zinc with 10.3mg per 100g of seeds. They are also an excellent source of minerals including magnesium, potassium and phosphorous. As well as this food boosting testosterone for performance, the zinc is also an important source of nutrients for health– in particular your prostate, with low levels of zinc being associated with enlarged prostate glands. 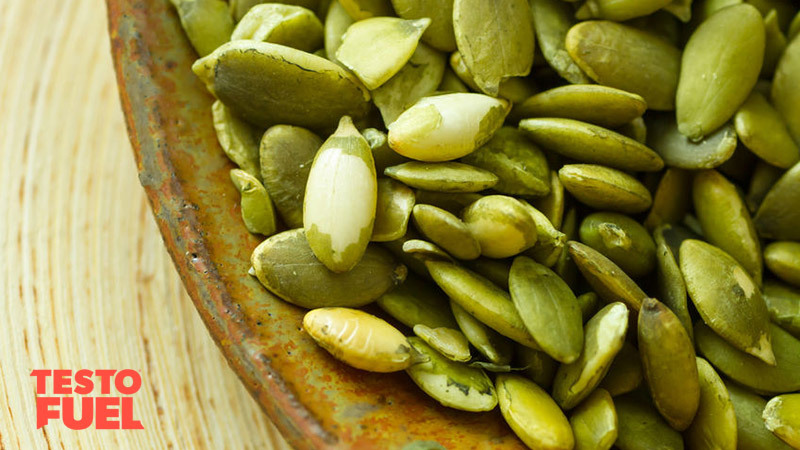 Essentially, pumpkin seeds limit the conversion of T to dihydrotestosterone (DHT) which, when elevated, can cause enlarged prostates. For example, one study  found that by giving 320 mg per day of pumpkin seed oil to males with benign, enlarged prostates, increased prostate specific volume decreased. Top Tip: Throw some pumpkin seeds in your oatmeal or grab a handful with some berries. Its never a bad thing to get the dark green vegetables in your diet- they’re packed full of fiber, as well as a range of vitamins and minerals. Broccoli is a perfect example of such cruciferous vegetables. Broccoli has anti-estrogenic properties- it helps to block excess female hormone levels in your body. As estrogen can diminish T levels it is important that estrogen is kept at bay. Broccoli contains a number of phytochemicals that can reduce excess estrogen build up in the bloodstream. As broccoli contains indole-3-carbinol (I3C) that helps to rid the body of estradiol- a key component of estrogen. For example a study by Michnovicz et al  found that by supplementing 6-7mg per kg per day of I3C for one week, urinary concentrations of nearly all estrogen metabolites, including levels of estradiol were lower. 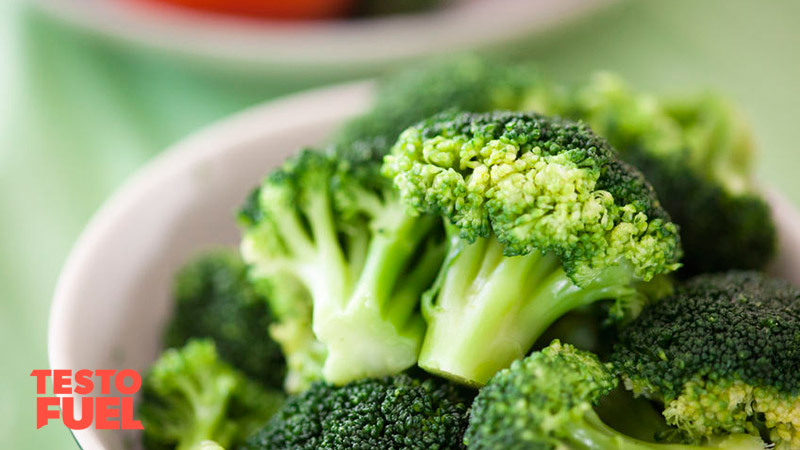 Top Tip: Elevated levels of estrogen have also been linked to heart disease and various cancers so it is important to eat foods like broccoli on a regular basis. Each avocado is around 80% fats so it provides a great source of fat soluble vitamins as well as essential fatty acids. They are also a good source of vitamin B6 and folic acid which help you to raise energy levels- they provide a whopping 1.7kcal per gram  so are great for getting energy in. 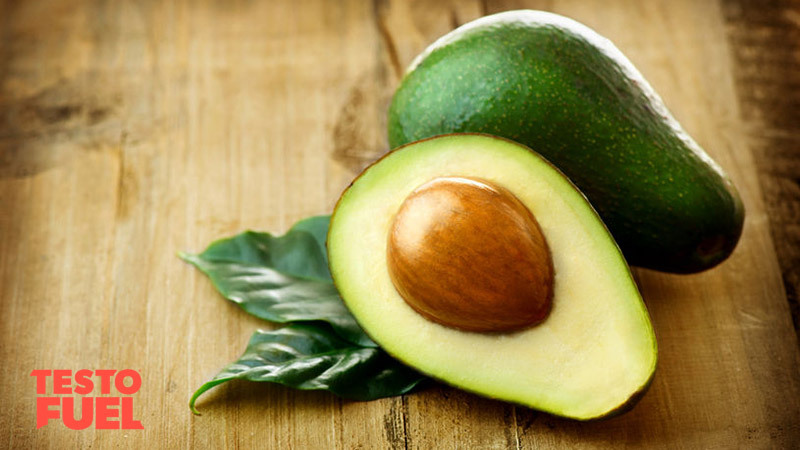 Avocados as a great source of all major fat types- monounsaturated fats (MUFAs), polyunsaturated fats (PUFAs) and saturated fats (SFAs) with a hass avocado (the most commercially available type) providing 71% MUFA, 16% SFA and 13% PUFA . As steroid hormones such as testosterone are made from fats, it goes without saying that dietary fat has a significant impact on T concentrations . Higher fat diets help you to increase your T levels, and with avocados providing all necessary building blocks, they seem a perfect choice to add to your T boosting diet. Top Tip: Fats provide the essential building blocks for testosterone production which make as them key in any T boosting diet. 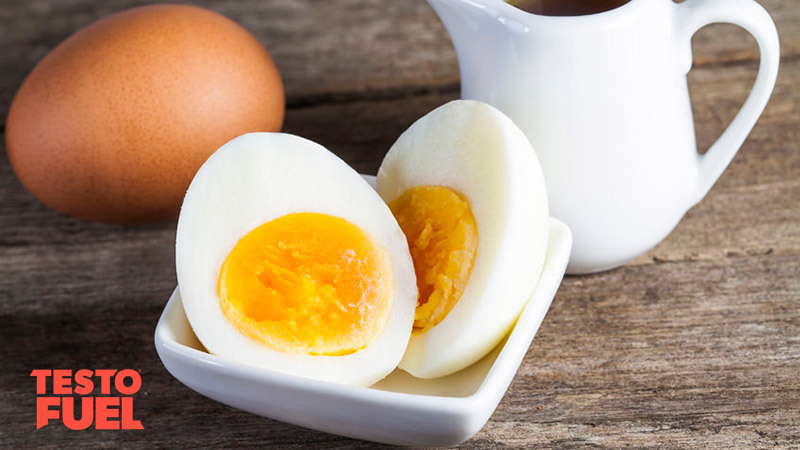 The good old egg will provide you a range of fats and proteins making it a potent T boosting food- one egg will give you around 75kcal, 7 grams of protein and 5 grams of fat. Additionally, they’ll also provide you with a range of vitamins and minerals including the fat soluble vitamins A, D and E as well as minerals selenium. They’ll also provide you with iodine which is essential for proper thyroid hormone production. Within those 5 grams of fats you’ll find a decent hit of the cholesterol (in particular high-density lipoproteins or HDLs)- you’ll find this in the yolk of the egg so make sure you don’t go old school and just eat the whites. Egg whites are great for protein but you’re far better off going for the whole thing. And just when you thought the yolk couldn’t get any better, one egg yolk will provide you with around 50IU Vitamin D3, which is a formidable testosterone boosting sunshine vitamin . Top Tip: Don’t skimp on the yolk- not only will you get the T stimulating cholesterol, you’ll also get a good hit of vitamin D3. 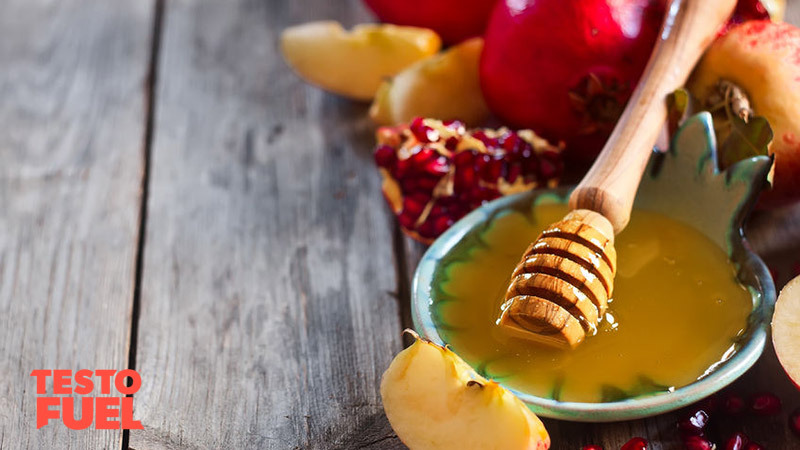 This one probably isn’t the first food source that springs to mind when you think of T boosting foods- but honey works similar to broccoli in that it has anti-estrogenic properties, although the mechanism behind it is different. Honey contains chrysin and the trace mineral boron in relatively high amounts. The flavenoid Chrysin, found naturally in bee pollen, is an estrogen blocker as it reduces the rate at which T is converted to estrogen. One study by Gambelunghe et al  for example found that 21 days of doing honey containing 1mg per g of chrysin helped to block the conversion of T to estradiol. However, it had no positive effect on T levels- so whilst there’s no evidence to suggest that it directly increases T levels, it does help off set conversion to female hormones. Boron can also be found in honey. You’ll get around 7mg per kg of this trace mineral. Boron works similarly to chrysin in that it is also an estrogen blocker but may also help to increase T levels too- for example Nahii et all  found that by supplementing 11.6mg of boron over a 7 day period, not only did free estrogen fall by ~40%, T-Levels rose by 28%. Top Tip: Other estrogen blocking foods include pineapples, citrus fruits, grapes, melons and sesame seeds. Similar to eggs, tuna provides a great source of vitamin D- as we’ve already mentioned, this is a great T booster . 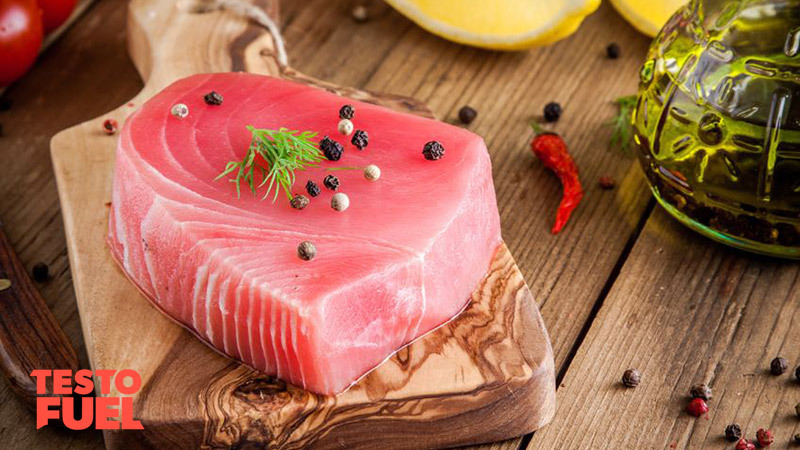 As a low calorie oily fish source, tuna will also provide you with omega-3 fatty acids which will help improve memory and heart health, as well as boost insulin sensitivity and mood. As we’ve already mentioned, fats are important in steroid hormone production, and as a source of PUFA fats, omega 3s are an important building block in this process. One study by Sebokova et al  for example found that diets high in omega 3s increased luteinizing hormone (LH) which is an important trigger of T production. Top Tip: Vary your oily fish sources to include sardines, salmon, anchovies and mackerel as well as tuna. 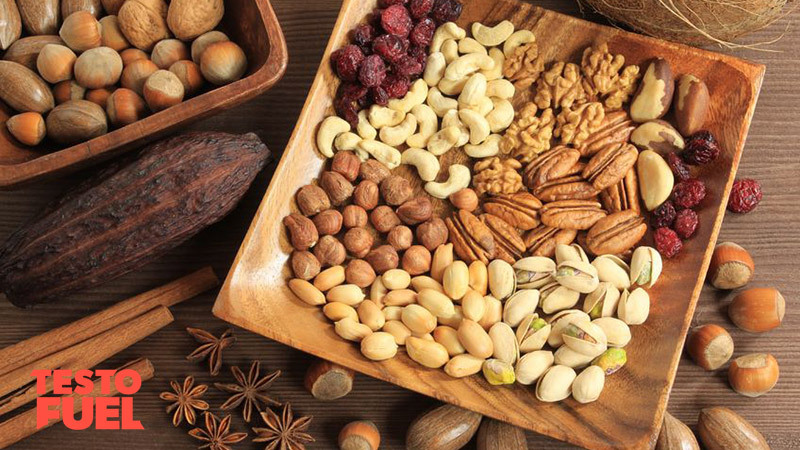 Nuts provide you with a range of essential nutrients essential to male health and performance. Walnuts and almonds in particular seem to have excellent health benefits- for example the tocopherols contained in walnuts has been linked to reduced prostate health issues  as well as reductions in low-density lipoprotein (LDL) production  – the cholesterol associated with poor vascular health and cardiovascular disease, due to their high PUFA content. Almonds have been found to contain high levels of magnesium and zinc, which have both been shown to boost T levels [1,2]. They’ll also provide you with a good source of vitamin E. It is recommended by the Almond Board of California to aim for 23 almonds a day to maximize health benefits . Top Tip: Aim to eat your almonds raw not roasted as this may alter the bioavailablity of its chemical compounds. Almond butter or milk also provide variety. Again, this one might seem like a strange T boosting food at first thought, but this leafy green, biennial plant is an excellent source of vitamin C as well as the mineral manganese- an important mineral is supporting optimal T levels. For example, in a study by Lee , manganese supplementation was found to stimulate LH production and increase sperm count. It is well regarded for its anti-cancer and anti-inflammatory properties and similar to broccoli, cabbage is packed with indole-3-carbinol (I3C) which is a potent anti-estrogenic . 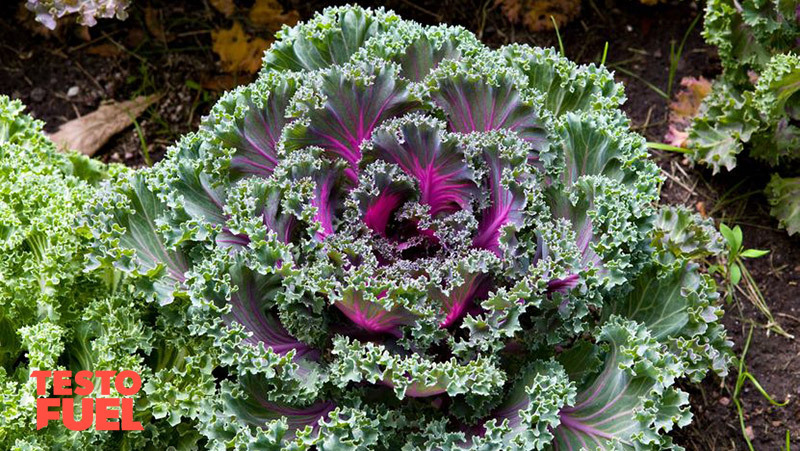 Top Tip: Vary your cabbages- regularly try both green and purple varieties for a full range of vitamins and minerals. This berry is packed full of vitamins B12, C ad K as well as anthocyanin– a potent antioxidant . The bioactive chemical in pomegranate, punicic acid, has been associated with a number of health benefits including decreased inflammation, blood pressure and blood sugar [16,17]. Throughout history, pomegranate has symbolized fertility and has been postulated to enhance sexual function and drive . A paper in Clinical Nutrition  found that pomegranate juice supplementation over a 7 week period boosted sperm count and motility, and density. A study in Endocrine Abstracts  reported an increase of 24% in salivary testosterone using a sample of 60 people over a 2 week period. Top Tip: Pomegranate juice is an easy option to boost your health, but the fruit contains seeds which boost it even more. Testosterone is the male hormone responsible for masculinity- its helps us add lean muscle and increase our strength. This list of foods will help anyone maintain or even elevate their T levels naturally- it’s a particularly useful list for those with lower T levels, or for those who are looking to get more. Focus on the foods you like and if you think you may have an allergy or intolerance then replace one of the foods for something else. Think about combining foods into a T boosting meal where possible. We appreciate that it is difficult to get some of these foods in your diet- some of them are expensive, and some are difficult to prepare- who wants to prepare oysters on a daily basis? If you are struggling to get enough of these T-boosting foods in your diet then a great alternative is TestoFuel. Pilz S, Frisch S, Koertke H, Kuhn J, Dreier J, Obermayer-Pietsch B, Wehr E, Zittermann A. Effect of vitamin D supplementation on testosterone levels in men. Horm Metab Res.2011;43(3):223–225. Lansky, EP et al. 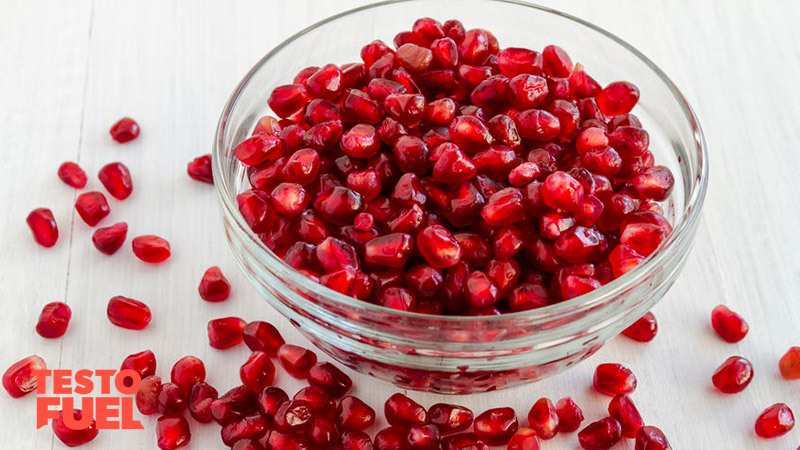 Punica granatum (pomegranate) and its potential for prevention and treatment of inflammation and cancer. Journal of Ethnopharmacology, vol. 109, no. 2, pp. 177–206, 2007.